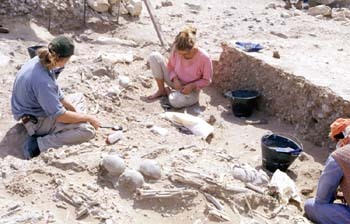 Al-Buhais 18 (English version - German version) - Late Stone Age burial grounds and settlement in Sharjah emirate (being investigated by Sharjah Museum in collaboration with the University of Tübingen, Germany). Kiesewetter, H. 2003. The Neolithic Population at Jebel Buhais 18: Remarks on Funerary Practices, Palaeodemography and Palaeopathology. In: D.T. Potts, H. Naboodah and P. Hellyer (eds. ), Proceedings of the First International Conference on the Archaeology of the United Arab Emirates (Abu Dhabi, 15-18 April 2001). Trident Press, London. pp. 35-44. Kiesewetter, H., H-P. Uerpmann and S.A. Jasim. 2000. Neolithic jewellery from Jebel Al-Buhais 18. Proceedings of the Seminar for Arabian Studies 30: 137-146. Uerpmann, H.-P. and M. Uerpmann. 1999. The camel burial of al-Buhais 12 (Sharjah, U.A.E.). In: C. Becker, H. Manhart, J. Peters and J. Schibler (eds. ), Historia Animalium Ex Ossibus - Beiträge zur Paläoanatomie, Archäologie, Ägyptologie, Ethnologie und Geschichte der Tiermedizin; Festschrift für Angela von den Driesch zum 65. Rahden/Westf., Leidorf. 8: pp. 455-462. Uerpmann, M. 2003. The Dark Millennium - Remarks on the Final Stone Age in the Emirates and Oman. In: D.T. Potts, H. Naboodah and P. Hellyer (eds. ), Proceedings of the First International Conference on the Archaeology of the United Arab Emirates (Abu Dhabi, 15-18 April 2001). Trident Press, London. pp. 73-84. Uerpmann, M. and H-P. Uerpmann. 2000. 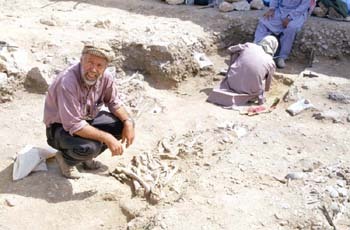 Faunal remains of al-Buhais 18, an aceramic neolithic site in the Emirate of Sharjah (SE-Arabia) - Excavations 1995-1998. In: M. Mashkour, A.M. Choyke, H. Buitenhuis and F. Poplin (eds. ), Archaeozoology of the Near East IVB - Proceedings of the fourth international symposium on the archaeozoology of southwestern Asia and adjacent areas. ARC - Publicatie 32. Groningen, Netherlands, 40-49. Uerpmann, M., H-P. Uerpmann and S.A. Jasim. 2000. 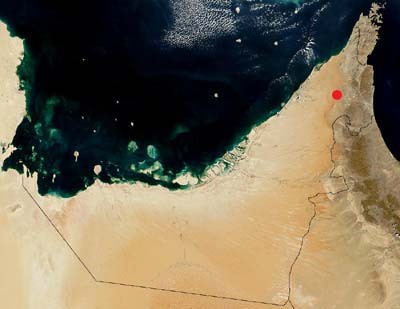 Stone Age nomadism in SE-Arabia - palaeo-economic considerations on the neolithic site of Al-Buhais 18 in the Emirate of Sharjah, U.A.E. Proceedings of the Seminar for Arabian Studies 30: 229-234.